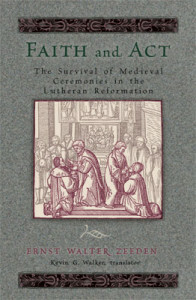 Faith and Act: The Survival of Medieval Ceremonies in the Lutheran Reformation presents Ernst Walter Zeeden’s classic study of how medieval church practices continued and developed within Lutheran church orders. Zeeden offers readers a unique perspective of how faith influences the act of worship. Historians of liturgy and theology will discover insights and important continuity between the Lutheran churches of the sixteenth century and their forebears of the late medieval period. The following excerpt from Faith and Act discusses the objects and vestments of the Lutheran service, as well as the liturgical language and the actions of worship. As for the appearance and implementation of the service, Lutheranism in central and northern Germany retained the liturgical colors, vestments, and vessels of the ancient church. Further, the evangelical Mass took over a good part of the wealth of the Catholic liturgy’s actions; it also took over the chanting of the priest and people, and principally also the Latin language, even if not to the extent of its use in the pre-Reformation Church. Alongside the liturgical actions, the church furnishings and fixtures were also retained to a certain degree, from the baptismal font and pictures to the banners and procession poles. Lutherans continued to use the five ancient liturgical colors as well as the liturgical vestments in the service and for sacramental acts; this usage lasted amazingly long, partly up to the brink of the nineteenth century. Insofar as Calvinism hadn’t discredited these earlier, they mostly disappeared first under the influence of the Enlightenment in the late eighteenth century. Apparently the Interim also contributed to usage of the chasuble and surplice becoming more firmly established. But also independently from this, liturgical vestments enjoyed the greatest favor in Lutheranism of northern. How greatly Lutheranism changed back to the conservative line on this point can be inferred quite nicely from Walter Delius’ reports on the 1555 visitation in the archiepiscopal-Magdeburg subdistrict (Amt) of Querfurt: The visitation showed that only three parishes still had chasubles in use; after that, all churches in the county were required to use them again; the parsons whose chasubles had disappeared had to go to Querfurt Castle and there be given new vestments. As far as lifespan goes, the ecclesiastical vestments remained in Weissenfels until 1588 and in Silesia until 1811. In Hamburg the celebrants wore an ornate chasuble during the Lord’s Supper until 1785; in Lusatia the choir boys wore surplices until 1850 (they wore these while holding the houseling cloths during Communion). Chasubles, which were regarded as a worthy ornament and therefore gladly retained, were also occasionally reinstated even in the later evangelical period. Thus they were used in 1740 in Silesia for consecrating new congregations; in 1659 they were reintroduced into Mecklenburg, in order thereby to serve a counterblow to the “libertinism and negligence of divine worship (libertinismo und negligentia cultus divini), which unfortunately are growing ever more prevalent from day to day.” The chasuble was, like the ceremonies, regarded as a symbol of the difference between Calvinism and as a criterion for pure Lutheranism, just as conversely, wherever Calvinism gained access, it immediately insisted on abolishing the surplice and chasuble. In the realm of the Saxon territories, the celebrant removed the chasuble over his head before the sermon, laid it on the altar, preached in his alb, and afterward put on the chasuble again. The same happened in Schleswig-Holstein; it was similar also in the Halberstadt territory. In Nürnberg, where, as elsewhere in southern Germany, not the chasuble, but only the surplice was retained, the celebrant took off the surplice before the sermon with the help of the sexton and put it on with him after the sermon to continue the service. Of the objects for the service with which pre-Reformation churches tended to be furnished, they kept altars, candles, pictures, and sculptures; likewise baptismal fonts and basins, bells, procession poles and banners, as well as little bells, which were rung during the service as a signal, for example during the elevation. Even the otherwise severely frowned upon monstrance remained in some churches, indeed even remarkably long in Stendal’s Jacobi church. Censers remained more widely spread. In fact, some places used incense more out of health concerns, for example to improve the air or to guard against the plague; sometimes even to warm the church a little during the cold season. At the same time, swinging the censer for liturgical purposes also remained in practice, for example in the Magdeburg cathedral before celebrating the Lord’s Supper, or in the Duchy of Weimar during Christmas Matins. As for other things concerning the conduct of the service, Latin, the priest’s and choir’s chant for particular portions of the service, and an abundance of liturgical actions, particularly of the clergyman, but also of the people, remained on principle from the ancient church. Chanting of the Epistle and collects were, to be sure, sometimes also dispensed with, although it was normally provided for. Whoever has a rusty voice, so it says in the 1591 church order from Goldstein in Upper Silesia, should leave out the singing and rather read the collects etc. slowly and clearly. Aside from custom, various other reasons, practical as well as pedagogical, spoke in favor of retaining Latin in the service. No one took offense at Latin on principle, because it was regarded as an adiaphoron. Further, it was regarded as beneficial from didactic viewpoints; Luther himself and Bugenhagen vigorously stressed this—the latter, for example, in the 1528 church order for the city Braunschweig. In Prussia, Latin was additionally viewed as apt on account of the many “non-Germans” there. Practical considerations also spoke in favor of remaining with Latin in matters of choral chant: Since at first the ancient church tones and melodies were adhered to, German translations of psalms, sequences, etc. would have to fit the given notes and their rhythm. Such a setting of German texts to ancient melodies did not, however, always prove to be feasible. Thus the ancient church language understandably held out the longest in the kinds of services having the most choral chant, Matins and Vespers. Latin hymns from the Middle Ages found entry into evangelical hymnals even into the eighteenth century. In other respects, the continued use of older service forms in Lutheranism can be traced not only to uncritical retention of what was customary; precisely some of the leaders of the Reformation fostered a conscious bond with tradition. In 1529 Melanchthon urged upon the parson in Coburg to change as little as possible in the service and to preserve the bond with the past; he therefore also implored him to retain some Latin components even in the village service. In an advisory opinion on worship reform the Saxon theologians gathered in Leipzig in 1544 expressed their desire to have Latin not totally disappear since the Old and New Testaments are written in Latin (! )—which in other words could only mean that when they read Holy Scripture, they reached for the Vulgate. Just how much people were attached to the ancient church language, and just how much they regarded it as belonging to the service, is clear from numerous statements in the church orders. The Pomeranian church order of 1569 spoke of “old Christian, magnificent chants, especially sequences and responsories.” The Hamburg Articles of 1535, adopted by clergy from numerous cities of the Hanseatic League at their convention in Hamburg as a kind of synodical treaty, not only decisively opposed the otherwise prevailing disdain for Latin by the mob, but also precisely represented the view that “it is necessary to use Latin in the church.” And although the same articles conceded with respect to the people (“ne suo exercitio careat populus” [that the people may not be without exercise]) that it was allowable at times to insert German hymns in the service, that was conceived of more in the sense of a concession. The authors of the articles regarded translation into German of all sung texts of the liturgy as downright dangerous: For if German were sung exclusively, then religion would unavoidably suffer damage, and finally all dignity of the service would go to ruin. As an addendum concerning the tenacious lifespan of the ancient church language in Lutheranism of northern Germany, it is noted that the high feast antiphons were sung in Latin in Hamburg until 1767, and that some town council decrees from November and December of 1790 first led to the gradual abrogation of Latin from the service in Lübeck. As it stood with Latin, so also with an abundance of ulterior rites, actions, and customs: They were taken over from the pre-Reformation period and lived on in the Lutheran Church, altered more or less. Insofar as they did not contain anything decisively unevangelical, no offense was taken at them. Concerning what was and was not evangelically tolerable, however, opinions diverged and views differed from one another. Thus the selection and mixture of that which was preserved from the realm of actions, rites, and vessels differed according to region and territory, or at least differed in part. Concerning the actions (kneeling, standing, making the sign of the cross, etc. ), Luther had judged that, as mere acts, they are worthless; as the expression of a sincere inner mindset of worship and adoration of God, however, they are useful and promote devotion. The Lutheran church orders accentuated the latter and took over a range of actions; to put it more accurately, on this point they left much as it had been. That was true especially for the worship acts of the clergy at the altar, but to a certain extent also for the people’s conduct in the church. From the Upper Palatinate, which crossed over to the Reformation early and steadfastly defended itself against the design of the Heidelberg electors to force Calvinism upon it, there are visitation reports from the outgoing sixteenth and early seventeenth century such as this: A parson got agitated about an old man taking a seat during the Gospel reading (1574); or because some people still reverently bowed before the only crucifix that had been left in the church of Auerbach. The liturgical and extra-liturgical use of the sign of the cross appears to have been judged and handled quite differently. A Brandenburg advisory opinion from 1598, on whose composition the later General Superintendent Pelargus admittedly partook and soon thereafter turned Calvinist, took unusually severe offense at the Berlin cathedral clergymen’s custom—supposedly not common otherwise—of making a cross over the bread or host, “as if by virtue and power of the form of the cross (virtute et vi crucis formatae) the presence of Christ’s body would be effected,” and recommended abrogating this action. In contrast, the sign of the cross over bread and wine made an especially strong appearance precisely in the seventeenth century, according to the sources referred to by Graff, and was widespread at the distribution of the Sacrament. The 1598 advisory opinion of Berlin theologians recommended “that the cross be made according to the ancient custom of the Church only once, when the benediction is spoken,” and appealed to the “manner of other churches” for this. The Lutheran Amberg catechism from 1595, on the contrary, recommended making the sign of the cross also for private piety: “Mornings, when you get out of bed, . . . Evenings, when you go to bed, you should bless yourself with the holy cross.” In Neumarkt the congregation was still “blessed with the sign of the cross” in 1596. Many church orders expressly prescribed kneeling at the consecration, such as Prussia 1568, Schleswig-Holstein 1637, Hohenlohe 1700, and Mecklenburg 1708. The Gotha order of 1645 added to this that even the dignitaries had to kneel (though in their stalls), and likewise the men. In Isny the pastor kneeled at the consecration. It was still widely customary in the seventeenth century to genuflect or exercise other “reverentia” when the name of Jesus was spoken. Johann Valentin Andreae increased the actions in his utopia of the model Christian state, in the respublica Christianopolitana of 1619: The congregation there was to kneel, raise their hands, or beat their chest at the times appointed during the service. Conversely the Reformed clergy and authorities, who did not much care for those kinds of things, took severe steps against them. In 1596 the county-court judge of Auerbach (Upper Palatinate) received instruction from his Calvinistic government to question women seen there kneeling before a cross. And since in 1615 a Reformed parson in Holnstein in the Upper Palatinate ranted about genuflecting and removing one’s hat (before the crucifix) being “nothing but the devil’s work,” we can conclude that Lutheranism had survived well there. Only since the seventeenth century did the Lutheran authorities increasingly weaken on this point. In 1655 the Leipzig Theology department recommended slowly putting an end to congregation members as well as midwives with baptismal candidates kneeling before the altar, likewise to people genuflecting whenever a clergyman walked by. Concerning the continuation of actions and use of liturgical vestments, ceremonies, and furnishings, it can still be mentioned that in 1736, King Friedrich Wilhelm I of Prussia, who was affiliated with Pietism, religiously zealous, and interested in the church, perhaps in executing the recommendations of his grandfather the Great Elector, prohibited the following as “Puppenwerk” (as child’s play or frivolous): candles on the altar, chasubles and surplices, the chanting of the clergyman at the altar and his facing the altar (instead of the people) as well as making the sign of the cross; he also forbade a cross to be carried in front of a funeral procession. It remained for the enlightened King Friedrich the Great, of all people, to lift this ban and thereby make room again for the ancient church ceremonies in the Lutheran Church in the kingdom of Prussia. Nikolaus Müller, “Zur Geschichte des Gottesdienstes der Domkirche zu Berlin in den Jahren 1540–1598.” Jahrbuch für branden-burgische Kirchengeschichte 2/3 (1906): 529; cf. also 455: Making the sign of the cross at the consecration of the blood was also practiced in the Mark, although it was not provided for in the church orders! Karl Ramge, Das gottesdienstliche und kulturell-sittliche Leben des alten lutherischen Amberg 1538–1626/28. (Neuendettelsau: Freimund-Verlag, 1938), 93. [This was already in Martin Luther’s Small Catechism (1529), in the section “How the head of the family should teach his household to bless themselves in the morning and evening.”]; cf. also the 1570 Kurland church order: “In the houses therefore . . . morning and evening prayer should be held for everyone, especially the little children—and that without scorn for the sign of the holy cross—which without any superstition are signs of our faith and confession (signa fidei et confessionis nostrae), the Christian’s banner and ensign. And on account of this, the sign of the holy cross at the Lord’s Supper is called the shield of faith, the impenetrable wall of believers (scutum fidei, inexpugnabilis murus credentium) in the Lives of the Fathers (vitae patrum).” Sehling 5:91. The department thought there was a certain danger in this of turning to the false faith in the Catholic way. From the standpoint of folklore, there is also an interesting note here regarding the rites for men removing their hat. On principle they kept it on in the church and took it off only briefly when entering (for a silent prayer). The next time the hat was removed was at the collect; it was put on again for the pericopes, and was removed only briefly when the names Jesus, Immanuel, Alpha and Omega, and the like were read. The 1614 Ratzeburg church order prescribed that when the catechism was read (by the sacristan), the men should stand, and should also remove their hat at the words on which the sermon was to be preached. Some footnotes have been amended or omitted. 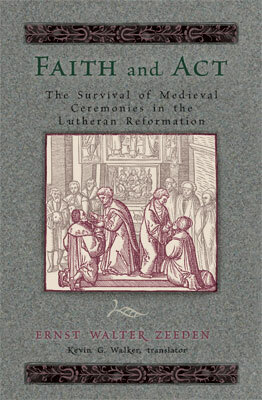 From Faith and Act: The Survival of Medieval Ceremonies in the Lutheran Reformation, pages 36–39. © 2012 Concordia Publishing House. All rights reserved. 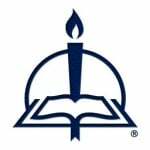 To order Faith and Act, please contact CPH at 800-325-3040 or visit www.cph.org.